i can't believe i am posting this picture! let's all just remember that it was the 80's and i ma now ashamed of my hair and glasses. julie inspired me to blog about the christmas traditions that i remember. we lived with my grandmother so most of the traditions took place in our house. ~grandma always bought the double layer yellow box of whitmans chocolates. and then she would let us poke out thumb through the bottom so we could see if we liked that kind or not. ~the canister of hard candy we had every year. i bought one this year. ~we always made homemade pizza and put the christmas tree and watched christmas movies all night. ~my mom's side of the family all came over to our house on christmas eve. 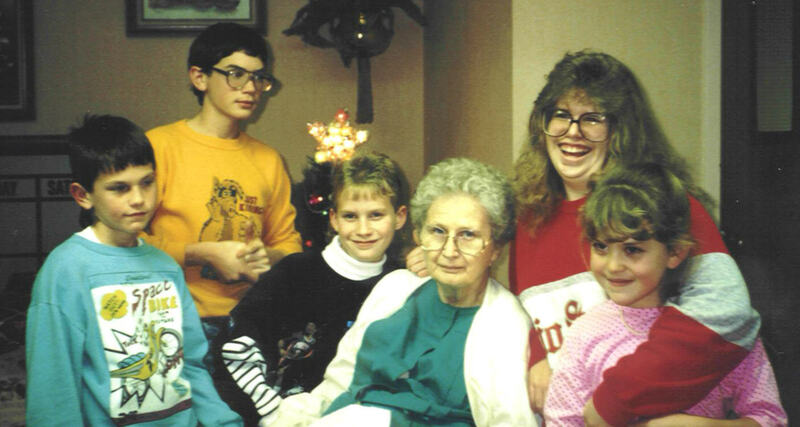 after grandma was moved to the nursing home we all went there every christmas eve. that's where the above picture was taken. ~every christmas eve we had ham sandwiches; aunt sandy's cheesecake, fruit salad and sugar cookies; mom's apricot salad and cheese and broccoli casserole. ~we always ate and then opened presents. ~our neighborhood was the neighborhood that everyone came to to look at christmas lights. but after we opened presents and everyone left we would go out with grandma and look at christmas lights. ~christmas music played all december. i miss christmas with grandma. it will never be the same! Christmas just isn't the same when you start losing the ones you care about. This post really made me reflect on some good times with my grandma (that lived with us) and my mom. Hey Jenn! It seems like forever since you were here in Hungary. Thanks for periodically stopping by our blog. God bless you guys. you are a blessing to many.